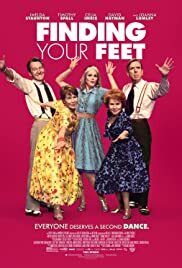 As the title of the film implies FINDING YOU FEET refers to finding ones footing in life with dancing helping along the way. 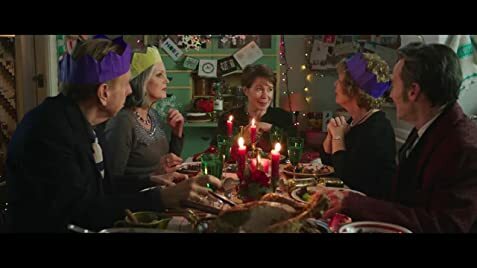 When the film opens Sandra Abbott (Imelda Staunton) is about to become a Lady, thanks to the success and fame of her husband, Mike (John Sessions). They have enjoyed a good long marriage together till this party, where she catches him red handed kissing her friend in the dark. She abandons him, distraught and shows up at the council flat of her bohemian sister. No need to guess that she is then taught how to behave like a less haughty human being as well as to enjoy the simplicities of life, which includes attending the sister’s dancing class. She also gives love a second chance, in the form of Charlie(Timothy Spall), who’s wife Lily (Sian Thomas) is suffering an advanced stage of Alzheimer’s at a nursing home. Three great performances to be entertained here by Oscar Nominee Imelda Staunton (Mike Leigh’s VERA DRAKE), Timothy Spall and Celia Imrie . These performances distract from the facts that the film is not really funny nor are there many funny parts, nor is the script particularly bright. But the charm of the actors come across quite effectively for the audience not to notice the film’s shortcomings. Absolutely Fabulous’s Patsy (Joanna Lumley) lends her hand in the role of a five time divorcee offering advice for Sandra. Lumley is the only real comedienne in the cast. Staunton and Spall are known more for their serious comedies. Director Loncraine has made comedies in the past as in Michael Pailin in THE MISSIONARY but also more serious films as RICHARD III and in one of my favourite films, BRIMSTONE AND TREACLE with a young Sting making his acting debut. The dance metaphor which reflects Sandra getting on back to her feet after her matrimonial disaster works quite well, though it can hardly not be noticeable. Sandra gets back into the dance groove, together with her old cronies with a few solid but simple choreographed numbers to old tunes like Rockin’ Robin and newer numbers like La Freak. FINDING YOUR FEET is an old folks Harlequin romance that goes through all the usual obstacles and predictability of finding true love lifted slightly by the presence of both Imelda Staunton and Timothy Spall.